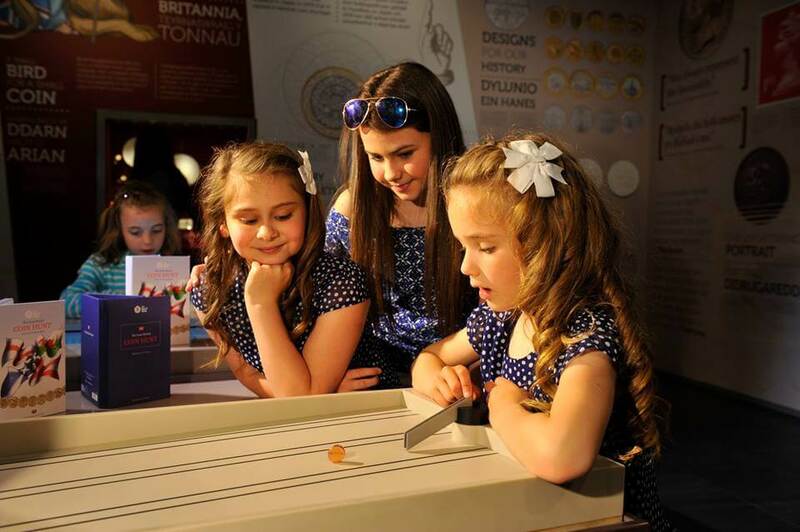 The Royal Mint Experience is very easy to find and not far off the M4 (Sat Nav: CF72 8YT/J34). The carpark has plenty of space and is free. Our experience began from the carpark to the entrance as we read the “fun facts” about the Royal Mint on our walk in. We loved the bridge over the water too- very pretty. Outside the experience we found Shaun-Xiào, the Royal Mint Shaun the Sheep made for the 2015 Shaun in the City Art Trail in London and Bristol. Inside the experience we found the penny covered, “National Treasure Gromit” who we last saw in Bristol in 2012 during the Gromit Unleashed trail. The Mini Penny, made famous by the Beatle’s Penny Lane, is also on display. We checked in at the welcome desk. While here you can also pay for the opportunity to strike your own limited 2016 £1 while on the tour. It costs £3.50 per person or two for £5. These can also be purchased while booking your tickets in advance. As we arrived early for our tour we sat and had a coffee and snack to recharge before our experience began. We loved reading all the “penny” sayings printed in the foyer. It’s surprising how these coins impact on our lives in many more ways than just being a form of currency. The cafe also sells delicious hot and cold meals which we enjoyed at the end of our tour (my original plan was to have lunch in between the tour and exhibition but you go through these simultaneously so make sure you plan to eat either at the very beginning or very end of your experience. In the foyer, you will also find toilets and lockers (which take a £1 coin). These are handy so you can travel light through the tour. When it was time for our tour we were called to come and join the queue for our time slot. The staff are very friendly and helpful. As we were entering a building containing a lot of money, of course we went through security, putting phones and keys in a tray, walking through a metal detector (both mum and I set it off-oops!) and having our bags searched. You’ll be pleased to hear that we got in! When everyone had arrived we watched a short film and then we were ready to begin our tour. Our tour guide was very knowledgeable and also very funny. He kept the tour very entertaining for the children and adults alike. The tour is also very well organised- they even have umbrellas for guests to use in case it’s raining during the short outdoor walk to the factory. The kids were quite disapointed that the rain had stopped and we didn’t need to use one! We had a look at some “blanks” and learnt about how the coins are manufactured before the striking process. Next we were taken into the viewing area which looks into the striking area where thousands of coins are produced, 24 hours a day. We loved seeing (and hearing) the coins being poured into the funnel and also seeing the coins in the bins next to the window- so many coins! In the next room, we queued up to strike our own coin by pressing an all important button. These coins feature a special Royal Arms design by Gregory Cameron that won’t ever be going into general circulation so we’ll never find these in our change. They’re also the last of their kind as the “round pound” that we’ve been using since 1983 will be replaced by a 12-sided £1 coin in March 2017. There will be a six month period where the existing £1 coin and the new £1 coin will co-circulate and after that the legal tender status will be withdrawn. There will be no more “as round as a pound”! We will have to come back next year and mint a new 12 sided £1 coin to celebrate this change. After striking our coins we then had our “Photo with a fortune” taken (additional charges apply) which is another great memento. Next we entered the interactive exhibition which has six zones. There was lots of information to take in and read in here as we walked though. Thankfully, there are lots of interactive parts to amuse younger kids while older kids and adults take in the facts and do the “reading”. We went back over 1000 years and found out how coins were first hand minted in various places and then from 1279 made more securely in the Tower of London, then from 1811, in Tower Hill and finally in Llantrisant from 1968 (interestingly, I have just finished reading a memoir and the author’s father was a worker at Tower Hill and against the move as he wanted to keep the jobs in London. I hadn’t thought about this aspect of the move before.). At Tower Hill the last coin was minted in 1975, a gold sovereign. Many workers uprooted their families and moved to Llantrisant so it had a huge affect on communities. It was fascinating learning about how many countries (over 100) the Royal MInt has produced coins and medals for. My youngest girls loved using the light up map to see the currency used in other countries and were very impressed with some of the more exotic designs. The kids all enjoyed designing their own £1 coins. The new £1 has actually been designed by a 15 school boy (he won a competition) so you never know this practice could come in handy for designing future coins! I loved discovering the detailed design process, especially seeing the sketchings for the commemorative coins- the Beatrix Potter ones are delightful! It was fascinating to see the military, sporting and commemorative medals that the Royal Mint have also produced. Danny loved the war medals while Rebecca enjoyed seeing the Olympic London 2012 medals! It was also interesting hearing about the Royal Mint having to make and transport extra medals when lots of competitors came in joint place. I loved this section looking at the everyday meaning of coins in our lives. There is a wishing well (pennies are supplied for you to throw in) which sings a nursery rhyme and also a Penny Farthing bicycle which moves when the money is slotted in. Mum and I liked the white sculptures above showing the lucky sixpence in a Christmas pudding and in a bride’s shoe etc. The kids loved the simple penny games, such as rolling the penny into the slot. It reminded me of playing many simple but fun games with pennies in school. Lastly we discovered more about coin collecting and I’ve definitely noticed the kids taking more of an interest into my own collection of old, foreign and commemorative coins at home since. We had a lovely time and only left the exhibition due to our hunger! We collected our photo from the gift shop where there is a wide selection of commemorative coins and other souvenirs to buy. We then went to the cafe to enjoy our delicious lunch, then it was time to make our way home. We all agreed that it was an informative, enjoyable trip and one we will definitely make again. I will also keep an eye out for their special events in the future as we missed these in the summer. 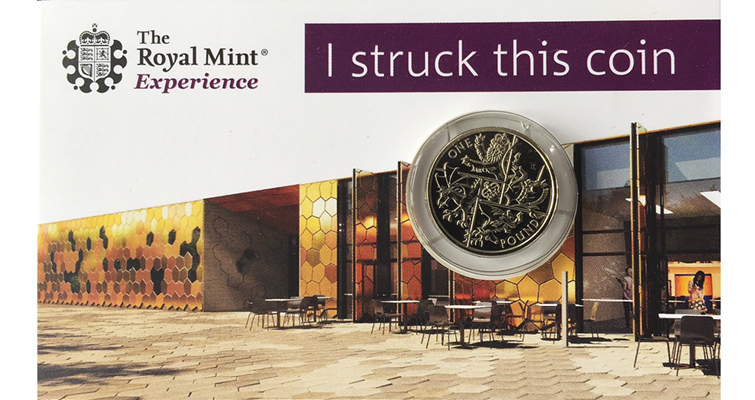 The Royal Mint Experience is open to visitors 7 days a week throughout the year (check in advance for seasonal changes and Christmas opening hours). We were provided tickets for the purpose of our review. All opinions are honest and our own.